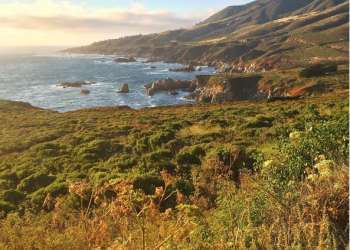 Boasting consistently mild and sunny weather, Monterey County is an easy journey to pack for — just keep in mind it’s all about layers. In the summer months, coastal fog may rest over downtown Monterey and Carmel, but this usually burns off around midday. Generally, spring and fall are warm and sunny, with daytime temperatures averaging in the 70s. The inland valley regions are significantly warmer, so be prepared when traveling back and forth while sightseeing. September is the hottest month of the year, with valley temperatures spiking at 90 degrees. Remember to pack a jacket if your event is in January or February, the coolest — and often the wettest — months of the year. January 5:20pm 44° 58° 4.40"
February 5:55pm 45° 60° 4.05"
March 7:20pm 45° 61° 3.38"
April 7:50pm 46° 62° 1.49"
May 8:15pm 48° 63° 0.56"
June 8:45pm 50° 65° 0.20"
July 8:30pm 52° 66° 0.05"
August 8:00pm 53° 68° 0.07"
September 7:30pm 53° 70° 0.24"
October 6:35pm 51° 68° 0.24"
November 5:10pm 47° 63° 2.32"
December 5:00pm 44° 58° 3.41"